Cardiac magnetic resonance imaging and echocardiography are currently regarded as standard modalities for the quantification of left ventricular volumes and ejection fraction. With the recent introduction of dual-source computedtomography (DSCT), the increased temporal resolution of 83 ms should also improve the assessment of cardiac function in CT. The aim of this study was to evaluate the accuracy of DSCT in the assessment of left ventricular functional parameters with cardiac magnetic resonance imaging (MRI) as standard of reference. Fifteen patients (two female, 13 male; mean age 50.8 ± 19.2 years) underwent CT and MRI examinations on a DSCT (Somatom Definition; Siemens Medical Solutions, Forchheim, Germany) and a 3.0-Tesla MR scanner (Magnetom Trio; Siemens Medical Solutions), respectively. 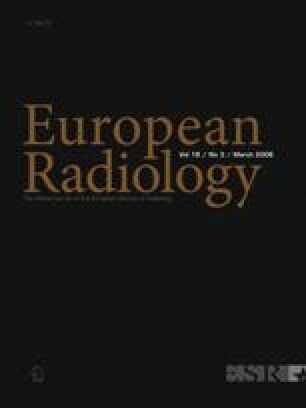 Multiphase axial CT images were analysed with a semiautomatic region growing algorithms (Syngo Circulation; Siemens Medical Solutions) by two independent blinded observers. In MRI, dynamic cine loops of short axis slices were evaluated with semiautomatic contour detection software (ARGUS; Siemens Medical Solutions) independently by two readers. End-systolic volume (ESV), end-diastolic volume (EDV), ejection fraction (EF) and stroke volume (SV) were determined for both modalities, and correlation coefficient, systematic error, limits of agreement and inter-observer variability were assessed. In DSCT, EDV and ESV were 135.8 ± 41.9 ml and 54.9 ± 29.6 ml, respectively, compared with 132.1 ± 40.8 ml EDV and 57.6 ± 27.3 ml ESV in MRI. Thus, EDV was overestimated by 3.7 ml (limits of agreement −46.1/+53.6), while ESV was underestimated by 2.6 ml (−36.6/+31.4). Mean EF was 61.6 ± 12.4% in DSCT and 57.9 ± 9.0% in MRI, resulting in an overestimation of EF by 3.8% with limits of agreement at −14.7 and +22.2%. Rank correlation rho values were 0.81 for EDV (P = 0.0024), 0.79 for ESV (P = 0.0031) and 0.64 for EF (P = 0.0168). The kappa value of inter-observer variability were amounted to 0.85 for EDV, ESV and EF. DSCT offers the possibility to quantify left ventricular function from coronary CT angiography datasets with sufficient diagnostic accuracy, adding to the value of the modality in a comprehensive cardiac assessment. The observed differences in the measured values may be due to different post-processing methods and physiological reactions to contrast material injection without beta-blocker medication. S. Busch and T. Johnson contributed equally to this study.